BNP senior leaders on Wednesday alleged that discipline in the country's transport sector was not restored as the government did not materialise the demands placed by the students during their 'safe road' movement last year. Speaking at different programmes, they also said the loss of huge lives in road accidents is manifesting the anarchy in the country's transport sector. "Students have taken to the streets once again demanding safe roads. A private university student lost his life as roads are unsafe. In the face of a movement earlier, the government pledged to ensure road safety, but didn't do that," said BNP standing committee member Khandaker Mosharraf Hossain. Speaking at a discussion, he also said the recent death of the university student has demonstrated how much unsafe the roads are. "It's a failure of the government." Nagorik Odhikar Andolon Forum arranged the programme at Dhaka Reporters' Unity (DRU) demanding BNP chairperson Khaleda Zia's release. He said the roods could have been made safe for people had the government sincerely turned its promises made to students into action. "This is not a government of people and students as it's a fascist regime. That's why it doesn't live up to its commitments." Describing the students' current movement for safe road as a justified one, Mosharraf urged the government to take necessary steps as per the students' demands for making the roads safe for commuters. He also said their party has support to the students' movement. "We call upon the government to accept students' demand and not to carry out any repression on them." Abrar Ahmed Chowdhury, a student of Bangladesh University of Professionals, died in front of Bashundhara Gate on Tuesday morning after being hit by a bus, prompting students to wage a fresh movement for safe road. Speaking at a token hunger-strike programme, he also said the students took to the streets to register their protest against the country's anarchy. "We've been observing that anarchy has been prevailing everywhere in the country as there's no rule of law. 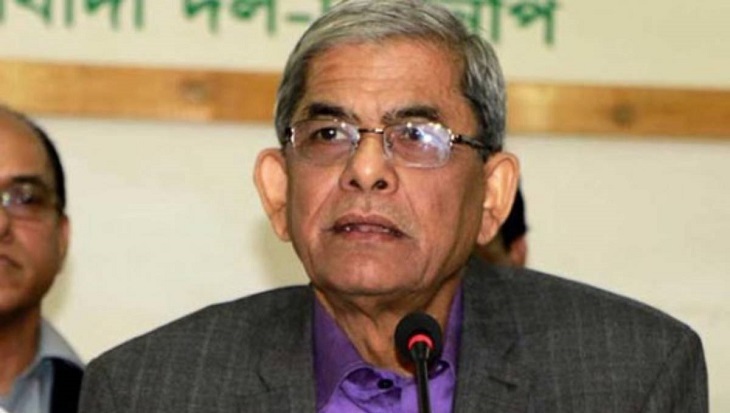 The current government, which usurped power, is failing to ensure peace and public safety," Fakhrul said. South Keraniganj unit of BNP arranged the programme at BNP's Nayapaltan central office, demanding party chief Khaleda Zia's immediate release from jail. The programme that began around 11am continued till 4pm. At a milad mahfil arranged by Jatiyatabadi Tanti Dal, BNP senior joint secretary general Ruhul Kabir Rizvi said the government could not ensure public safety on roads as a 'monster' like former minister Shahjahan Khan has been given the charge for restoring discipline in the transport sector. The BNP leader also said it will not be possible to remove mismanagement from the transport sector as long as persons like Shajahan Khan are involved with the sector.